We’d love your help. Let us know what’s wrong with this preview of The Way Home Looks Now by Wendy Wan-Long Shang. Twelve-year-old Chinese American Peter Lee and his family always shared a passion for baseball, bonding over backlot games and the Pittsburgh Pirates. But when a devastating tragedy strikes, the family flies apart and Peter's mom becomes paralyzed by grief, drifting further and further from her family. Hoping to lift his mother's spirits, Peter decides to try out for Littl Twelve-year-old Chinese American Peter Lee and his family always shared a passion for baseball, bonding over backlot games and the Pittsburgh Pirates. But when a devastating tragedy strikes, the family flies apart and Peter's mom becomes paralyzed by grief, drifting further and further from her family. Hoping to lift his mother's spirits, Peter decides to try out for Little League. But his plans become suddenly complicated when his strict and serious father volunteers to coach the team. His dad's unconventional teaching methods rub some of Peter's teammates the wrong way, and Peter starts to wonder if playing baseball again was the right idea -- and if it can even help his family feel less broken. Can the game they all love eventually bring them back together, safe at home? To ask other readers questions about The Way Home Looks Now, please sign up. This was a very well-written kid's book, the way I remember them being when I was a kid, before they just got repetitive and boring. 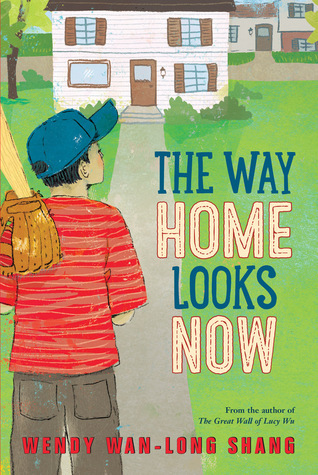 The Way Home Looks Now is not only interesting to read, but it's also original and it teaches kids about the values of love, family, friendship and playing outside, whether it's baseball, horseback riding, swimming, walking, bowling or any other activity that brings people together. This is a heartwarming story of Peter Lee and his family. They share a genuine love for the game of baseball, but a tragedy changes the dynamics within their family. Peter tries to move forward by joining a baseball team. During this time he sees that they all handle their grief differently. This one was hard for me to put down once I got into the story. - appreciated the ambivalent ending. Life is ambivalent, and I appreciate when literature reflects that. - I don't usually like sports books, but this one used sports as a vehicle to discussing familial themes. - As a Taiwanese American, I always love me some good Taiwanese American protagonists. - There were a lot of micro-aggression comments that went unanswered. I wish those were addressed at least once, by one of the characters. - The plot twist around one of the characters on the baseball team felt out of nowhere, and was distracting to the central story. It felt like a different plot altogether. This book was a mixture of inspiring and just a good book. It talk alot about how they overcome things and is just in general a good book. I hope someone takes the time to read this book because it is in fact a very good book. This review has been hidden because it contains spoilers. To view it, click here. I appreciate how Wandy Wan-Long Shang's books portray Asian American, more specifically, Chinese-Americans and Taiwanese-American experiences as cosmopolitans in terms of describing Asian characters as members of transnational community. The Way Home Looks Now portrays stories of a young Taiwanese-American boy, Peter and his family. Peter's father who Peter calls Ba is a strict and conservative Taiwan-born man who is not that far from typical Asian fathers who are often portrayed in stores someo I appreciate how Wandy Wan-Long Shang's books portray Asian American, more specifically, Chinese-Americans and Taiwanese-American experiences as cosmopolitans in terms of describing Asian characters as members of transnational community. The Way Home Looks Now portrays stories of a young Taiwanese-American boy, Peter and his family. Peter's father who Peter calls Ba is a strict and conservative Taiwan-born man who is not that far from typical Asian fathers who are often portrayed in stores someone inflexible but rule-based. Peter has a big brother Nelson who is biculturally insightful and a baby sister, Laney. After his brother, Nelson, was killed by car accident, things are dramatically changed. Most of all, Peter's mom goes through heavy depression. She cannot play the active mediator when Peter and Ba face heavy tension. The story depicts several themes through great baseball connections. Team spirit, gender issues and even subtle microaggression are embedded in story. Ba volunteers to be a coach for the baseball team and participating games and facing issues to maintain the team gradually changes Peter and Ba both to be open for each other. This book may inform the internal diversity under Asian-Americans. Touch of brief Taiwanese history and cultural ethos are applied in authentic ways while it doesn't make Peter as foreigner but enhance his being a member of "one of us" to audience like baseball creates “We” spirit for all boy characters and the girl baseball player, Erin. Gr 4-6-Twelve-year-old Peter just wants his home to be the way it was before-before his mother stopped talking, before she started sitting on the couch staring at the TV, and before his older brother died in a car accident. Peter's father is a strict Chinese immigrant who stresses homework, emphasizes respect for authority, and forbids baseball. Peter's mother and siblings loved the sport before his brother died; now baseball is no longer played or even talked about in the family. Peter becomes convinced that the way to get his mother back is to join Little League and play baseball again. He persuades his father to allow him to play, but during tryouts so many children show up that another coach is needed and Peter's father volunteers. This stressful dynamic shows Peter a different side of his father, a man who is mourning his son, loves his family, knows a lot about baseball, and believes in fairness. Peter is a fully realized character, but the rest of his family and most of the players on his team fall flat. VERDICT Though the plot occasionally gets bogged down with too many side stories, this heartwarming story is still a worthy purchase.-Lisa Nabel, Dayton Metro Library, OH (c) Copyright 2015. Library Journals LLC, a wholly owned subsidiary of Media Source, Inc. No redistribution permitted. Peter Lee's family loves baseball, cheering on the Taiwanese team when they come to a world championship in the early 1970s. When his older brother, Nelson, is killed in a car crash, however, his mother becomes so completely dysfunctional that she can't even get up off the couch to cook dinner, leaving Peter, his younger sister Elaine, and his father to fend for themselves. Peter is grieving for longer than necessary as well, and feels as if everyone at school doesn't talk to him because of his misfortune. Eventually, he decides that is he can play baseball the way that Nelson did, perhaps he can entice his mother to go to a game, and she will be able to regain her joy in being outside. Since there are too many players, Peter's father offers to coach a team, even though Peter thinks that his baseball experience must be limited, based on the poor players that his father picks. There are some surprises in the line up, which are quite interesting, and everyone but Peter's mother seems to improve a bit. In the end, there may be a little bit of hope for the woman. Strengths: I loved The Great Wall of Lucy Wu, so was really looking forward to this one. Shang writes riveting prose, and her "women's libber" twist and 1970s setting is fantastic. There's enough baseball in this one that sports fans will pick it up. Weaknesses: I was HUGELY disappointed in the ridiculous grief of the mother. It is not an option for parents to submerse themselves in their own grief about a dead child to the point where they can't take care of their living ones. No excuse, and this made me SO angry. I didn't just want to slap the mother, I wanted to punch her in the face. The father didn't help, either, letting the mother get away with it. Argh! Not okay, people. Not okay. Book Talk: Baseball, can baseball save his family? That’s what Peter is hoping when he takes a risk. He learns more about his Dad and has a little hope for the future. This book is beautiful in every way. Peter's passion for baseball is artfully woven into a story of family, grief, and learning who you are. Peter is a character who will resonant with boys and girls alike. His complicated relationship with his father grows to a moving crescendo in this story. This is a book that kids, parents, and teachers should read. Publisher's Weekly sums this one up perfectly -- "A grieving Chinese-American family begins to find strength and healing through a shared passion for baseball in this warm, hopeful novel set in 1972." Tragedy can really derail a person and it wrecks havoc on Peter's family. Great book - I really like Peter's father, Ba. A really lovely story about how grief can affect a family, and the different ways they try to cope with it. A love of baseball has been a common bond for Peter and his immediate family, with the exception of his father, Ba. So when tragedy strikes, Peter eventually tries to see if baseball can bring happiness back to his depressed and grieving mother. What he doesn't expect is that it will help him better understand Ba, and bring him closer to accepting his own feelings of grief and loss. There i A really lovely story about how grief can affect a family, and the different ways they try to cope with it. After his older brother's death, Peter Lee's mother sinks into a deep depression. Baseball was something the family celebrated together, so he concocts a plan to play baseball as a way of bringing her back to them. Whether it worked or not we don't find out in this book, but it does heal the schism between Peter and his father that was growing even before the tragedy. I want to say I love this book but the truth is I only loved the last half of it or so. I'm tired of books where there is a death After his older brother's death, Peter Lee's mother sinks into a deep depression. Baseball was something the family celebrated together, so he concocts a plan to play baseball as a way of bringing her back to them. Whether it worked or not we don't find out in this book, but it does heal the schism between Peter and his father that was growing even before the tragedy. This book is so incredibly important, how did I not know about it? Set during the Vietnam War and featuring an Asian-American family, I purchased this book for the diversity it would bring to my classroom (most of my students do not have experience understanding this cultural group). This book was so powerful. It begins shortly after the tragic death of the narrator's older brother, the star of the family. The father is put in the domestic role (rare for the time and culture) when the mother falls This book is so incredibly important, how did I not know about it? This book was so powerful. It begins shortly after the tragic death of the narrator's older brother, the star of the family. The father is put in the domestic role (rare for the time and culture) when the mother falls into a very deep depression and withdraws from all activities and refuses to leave the home. The older brother was a baseball fanatic and Peter, our narrator decides he's going to okay as a way to affect himself and his family. This 2018 Sequoyah nomination is a great book but so SAD. It really has so much baseball I'd love to give it to some of my baseball lovers but then the whole rest of the story isn't one I'd normally recommend to those same readers. I'm just not sure there is a large audience for this book. Moving story about a family and their love of baseball. Even through tragedy, baseball uplifts them through it all. Peter, 12 years old, learns to see his father in a different light. What a touching and heartwarming story. Highly recommended to all ages! I enjoyed the story. It read true to a young boy's outlook and the era. Sad about the mother, but encouraging to see the father and son working things out. This book is very highly recommended. It is very touching, but has excitement in it. It makes the reader want to know what will happen next. When a book makes me cry actual tears, it gets a fifth star. Beautifully written, warm, kind, thoughtful, and uplifting. Good book to recommend to my athletic students, especially the boys. Overall, I really enjoyed this novel. Although it took me longer to read, it still caught my attention with its historical fiction content. I really enjoyed that side of the story. I would not have picked this up if it hadn't been on our Battle of the Books list, but it gets better every time I read it. Loved the variety of hardships that Pete Lee and his family faced. I enjoyed the growth of the main character through the novel, but I felt like some very important things were left unresolved to my satisfaction. The story of a family that is learning how to come to terms with a great loss. It is a wonderful depiction of how different such a struggle can appear, and a young man who comes to realize that we all grieve differently. The book was also extremely heavy on baseball, which threw me off throughout most of the narrative. My parents, who grew up in China, had no favorite books from their childhood to share with me, which left me to my own devices in the library. When I mentioned this to a friend, she was a bit stunned, and I understood this reaction. I certainly never felt deprived as a child, but as a parent, it's hard to imagine not having that link. My own book is about finding the stories we discover about our f My parents, who grew up in China, had no favorite books from their childhood to share with me, which left me to my own devices in the library. When I mentioned this to a friend, she was a bit stunned, and I understood this reaction. I certainly never felt deprived as a child, but as a parent, it's hard to imagine not having that link. My own book is about finding the stories we discover about our families and how we are changed by them. I hope my book inspires its readers to find the powerful stories, both great and small, in their own families.